I have played viola since I first began my musical studies at age 9. As a result, I have seen teachers hold viola students back, simply because they play the "lesser" instrument in the viola family. I do not hold my students back and I hold them all to the same high level of playing, regardless of which instrument they play. Teaching Artist resident at Cambridge Public Schools, assisting with school orchestra rehearsals, sectionals, and lessons. Teaching violin students in a class at Longy's El Sistema program. Myself with a student quartet at the Lamont School of Music, shortly after a performance of Haydn's Op. 76 No. 5 quartet. On stage in a chamber orchestra, accompanying a performance of Bach's Concerto for Two Violins, arranged for two flutes. The Zabriskie Quartet in the recording studio with Damen Liebling, recording his String Quartet No. 1. A performance in a student group at the Longy School of Music of Brahms's Clarinet Quintet. Second Movement of Brahms's Clarinet Quintet. 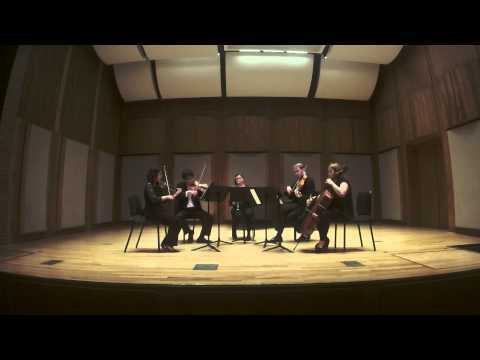 Brahms Clarinet Quintet, Third Movement. Brahms Clarinet Quintet, Movement 4. I've never had any experience with orchestral instruments before. After one lesson with Calvin, I'm learning to read music again. He showed me proper technique as well. I feel that I will be progressing quickly under Calvin's instruction. My first lesson flew by, and I learned so much in a very short amount of time. His attention to smaller details in technique are very helpful as well. I absolutely recommend Calvin as a viola instructor! Calvin is a great instructor and my daughter was smiling the entire time! He takes great care of making sure she is understanding what he is showing her and was flexible. He makes a great addition to our Unschooling homeschool and our family!